There are a lot of controls in your Post Editor that you might not know about! There are three sizes of font you can choose from in the editor. H1 - Your Title Text. This will be a large font on your site. H2 - Section or Subtitle Text. Slightly smaller than Title, but larger than your normal text. H3 - Normal or Body Text. This is your regular font size, smaller than both H1 and H2. Quotes - You can add a quotation to set apart some of your text in your post. This is a common style in journalism. You can also make lists, Ordered and Unordered, in your body text. 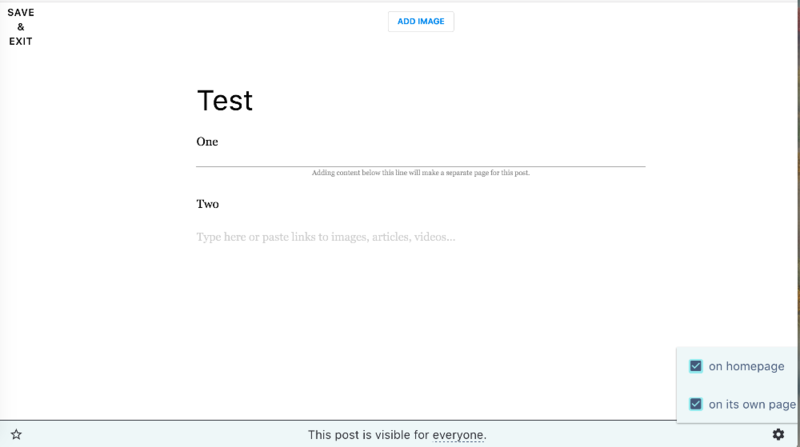 Additionally, you can add images in the editor to add some flavor to your text posts. Add as many as you like! The higher resolution the better. To make a post, click Write Something in The Grid web app, hover over the + to bring up your posting options. Choose Write Something to make a post that has content like images, text, URLs, videos, and audio. Keep in mind that video and audio content will need to be hosted on a third party website. If you'd like to have a post on your homepage that opens up in a new page, you can do so by clicking Make Full Post in the Post Editor. Clicking Make Full Post will make a line show up in the editor. Everything above the line will show on your homepage. Everything below the line will open in a new page when the content above the line is clicked on your homepage. When your visitor clicks the title or the image, your content that's entered below the line will load for the visitor to see on a new page. You can also add HTML and Code in the Editor. Check out more about this here.